Who is Jay Baruchel? For shame, he’s just one of the most popular nerdy-looking guys in Hollywood and he’s been here for a number of years now. He’s rubbed shoulders with some of the most famous people in the industry and proven that no matter how much of a geek he looks like he’s still someone that’s worth watching because of his hilarious manner and very sincere acting skills. It’s also worth noting that he recently took on the responsibility of directing the newest Goon movie starring Sean William Scott, which is a big step for him and a huge accomplishment in a career that’s been highly underrated. Who’s Jay Baruchel indeed. Take a look at these clips and you’ll know exactly who he is. As hiccup he’s unforgettable since he pretty much drives the entire movie. Even Gerard Butler, who is an awesome character no matter where he’s cast, isn’t quite enough to steal the show from Jay on this one. Plus, as Hiccup he’s kind of the character that no one wants to deal with so he has to be a little stronger on the personality to shine through. Here’s a movie where he fades into the background but in a good way. When he comes out finally and makes his character known it’s because the stuff has hit the fan and there’s no other way to be. When the guys think they’re still making a movie he plays the role of an extra and keeps his mouth shut for the most part. But when he needs to he starts shining something fierce. The star of the show might have Sean William Scott but his backup, his mouthpiece, is definitely Jay Baruchel. In a part that allows him to just go nuts and have fun without being the geek or the nerd or the shy guy waiting for a speaking part Baruchel becomes a wild man whose mouth might get him into a world of trouble if not for his big, iron-fisted friend. He’s a true add-on in this film and yet he’s so much fun to watch you can’t help but laugh. His character, Danger, is such a moron that you almost have to feel sorry for him thanks to the fact that he is really a developmentally handicapped young man that seems to have had no real training in life overall and is about as helpless as, well, a child. Everyone gets their turn to shine and here is one of Jay’s. You might think his character gets buried by Nicolas Cage and the others, but in truth he shines in this picture largely because it is more about the apprentice than it is about the magicians, and it’s more of a time for him to really come out as an actor than it is for the old dogs to strut their stuff. That’s why he’s such a great actor, he knows how to pick his spots. 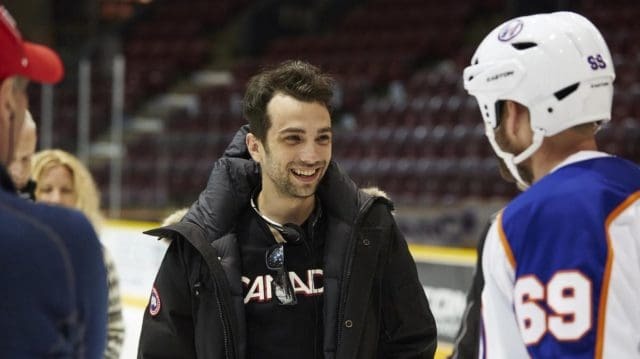 Jay Baruchel has already done a lot but he’s still got a lot more to give.